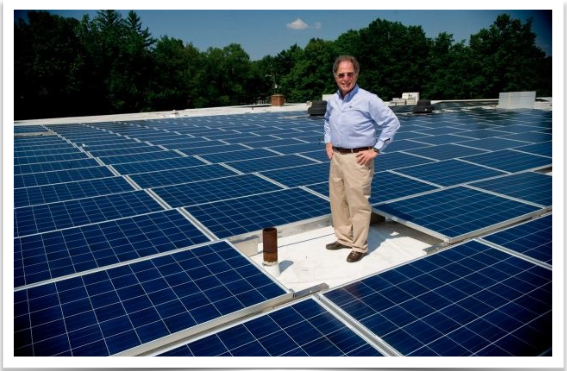 Temple Beth El in Stamford, Connecticut now has one of the largest installations of its kind on a house of worship in the United States and is also the 2013 Cool Congregations Challenge winner in the category of Renewable Energy. The new, 210 kW Photovoltaic Solar Panel System, utilizes 845 (250 watt) panels on the temple’s 30,000 square foot white “Energy Smart Solar Ready Roof” with three inches of insulation. The estimated power production is 237,479 kWh per year, and supplies the majority of the synagogue’s annual energy needs. Temple Beth El’s Go Green effort is reducing its greenhouse gas emissions and other environmental pollutants by eliminating over 265 tons of carbon dioxide emissions each year, the most of any Certified Cool Congregation so far. The congregation was already well on its way to being a model in energy efficiency due to a recent lighting upgrade throughout their building and outdoor spaces, that included switching to more efficient LED lighting and installing lighting occupancy sensors and high efficiency variable speed motors and drives. They also have high efficiency gas heating. The project is a point of pride for the congregation, whose leaders say it emphasizes the Jewish concept of Tikkun Olam, which means “repair the world” and urges people to fix what’s broken in society. See the project in action at liketheroof.com.